The Karkogel mountain near Abtenau rises up before the majestic backdrop of the Tennen Mountains, home to many ski tours for fun backcountry skiing in the Alps. Beginners, fans of easy ski tours and pros looking for a true challenge will find exactly what they are looking for in the Tennen Mountains. 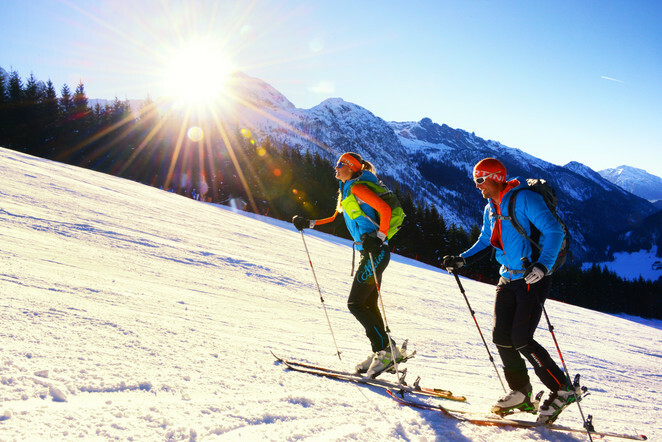 The majority of ski tours in our area can be done with GPS, meaning you can be confident you’ll always know where you’re headed. The starting points for ski tours in the Tennen Mountains are easily accessible. Most tours are perfect for a half-day excursion. Whether you’d like to take an easy tour for beginners or a more difficult tour, you’ll always be treated to amazing views of the surrounding Alps. Don’t forget your camera! Many ski tours in and around Abtenau can be completed in 2-3.5 hours, leaving plenty of time for some après ski fun in a ski hut! Two discos, four bars and four alpine chalets in Abtenau look forward to your visit! One of the most beautiful places for backcountry skiing in the Alps starts very close to Abtenau. You will cover a difference in altitude of 800m on the 4.8-kilometre-long tour from Abtenau to the rest area on the Gamsmutterkar (located at an altitude of 1,800m above sea level). Plan 2.5 hours for this tour (without breaks). This ski tour requires a medium level of physical condition and skiing technique. Go from the car park at the Hofhaus in the Lammertal Valley through the forest before the trail gets steeper and reveals beautiful views of the wild, romantic coomb. Enjoy the one-of-a-kind landscape, total peace and the feeling of recharging your body, mind and soul while ski touring in the Alps around Abtenau!